Deschutes Rolls Out in Philly! Today is Deschutes 25th anniversary, and they've chosen to celebrate it by doing their official launch in Philadelphia, their first East Coast market! I have to congratulate them on their perspicacity: this IS the best, most mature market on the East Coast. It is, after all, America's Best Beer Drinking City. This is a fantastic, red-letter day. I know, I know, I've bitched about carpetbagging west coast brewers before, but damn it, I will have no truck with a foolish consistency: this is Deschutes, baby, that changes the rules! I'm obviously out of my mind and incoherent, so here's the press release. Read it and weep for joy. Oh, and HAPPY 25TH, DESCHUTES! Bend, Oregon – June 27, 2013 – Today is Deschutes Brewery’s silver anniversary, and what better way to celebrate than with the long-awaited announcement that their beers will now be available year-round in the greater Philadelphia area? For the past four years, the Oregon brewery has fulfilled the thirst of Philly beer fanatics during one spectacular week, Philly Beer Week. Now, the brewery will be shipping beers all year to the six-county area served by Muller, Inc. Fans there will be now be able to enjoy Mirror Pond Pale Ale, Black Butte Porter, and Chainbreaker White IPA on draft and in bottles. 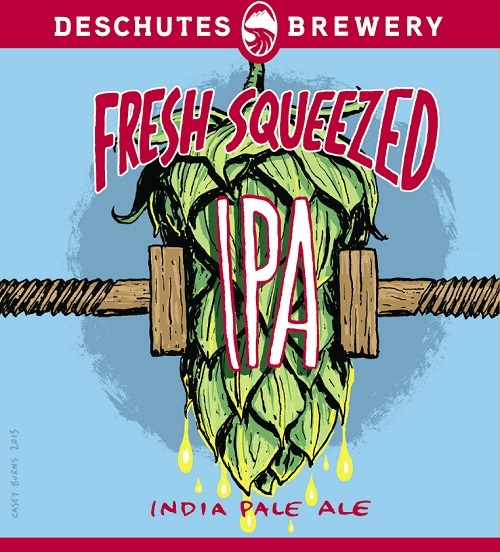 As a special treat, Philadelphia will be getting bottles of the brand-new Fresh Squeezed IPA, part of the brewery’s experimental Bond Street Series, plus bottles of Deschutes River Ale (Nice session ale!) and Inversion IPA. Deschutes Brewery began in 1988 as a brew pub in downtown Bend, Oregon – launching with and building a reputation around Black Butte Porter at a time when dark beer was not popular. This beer went on to become the number one selling craft porter in the United States despite only being available in a limited amount of states. It is in this spirit of experimentation and risk-taking that Deschutes Brewery has continued to grow, and it is now ranked as the fifth largest craft brewery in the nation. With this new launch, fans living in the greater Philadelphia area will not only have ready access to Black Butte Porter, but also to Mirror Pond Pale Ale, the quintessential, deftly balanced pale ale. In addition, the number one selling new craft brand in 2012 is coming: the hop-forward, citrus-packed, unmistakably smooth Chainbreaker White IPA. 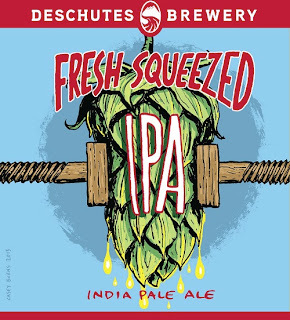 So popular in the brewery’s Oregon brewpubs that it made its way into bottles, the new Fresh Squeezed IPA is mouthwateringly delicious. Available only in bottles prior to this launch, these beers, along with some other popular and hard-to-find brews from Deschutes Brewery’s portfolio, will now also be available in draft. The gang from Deschutes Brewery, including a brewer, will be celebrating the launch with a week-long series of tastings and events in and around Philadelphia in early November. Look for more details in late summer on http://www.deschutesbrewery.com/events. I got the official word today that Deschutes is finally in Pennsylvania to stay, after teasing us with touch-and-go supply during the last four Philly Beer Weeks, and let me tell you...I'm a huge supporter of drinking your local breweries (easy for me to say, since my local brewers are incredible), and get annoyed by people who always want to drink beers "from away," but...damn me, I am so stoked about this! The idea of being able to buy a CASE of Twilight or Black Butte or Red Chair or Mirror Pond and just drink it without having to wonder when I might see the next one is just delirious-making. I love these guys forever, and have never ever regretted going way out of my way to visit them back in the 90s. So good. So when I opened up a sample of their new Fresh Squeezed IPA, it was with no trepidation whatsoever...other than the usual "oh damn, only one bottle" kind. And I was right: blossoming citrus aroma came pouring out of the glass to greet me (odd how aromatic it was, considering I was using one of those horrible sleeve pint glasses...), followed by a sip of deliciously citrusy/pithy hop-flavored beer that didn't crush my palate with bitterness, but just tasted awesome, and went on and on. Heh. Had a Twitter follower note to me that there have been complaints about this beer's "sweetness." As he said, "That's called 'balance.'" Right! It wasn't heavy, or cloying; it wasn't hop-tea astringent; it wasn't hugely alcoholic: it was a beer that I found very easy to drink the entire 22 oz. bottle of in one sitting, boom boom. Okay, Deschutes. You're in Pennsylvania, and welcome! Start sending more of the Good Stuff! I'm a crazy man: when was the last time I popped two posts in one day? What can I say, the possibility of privatization of the liquor stores -- and the end of the Case Law! -- has me giddy. 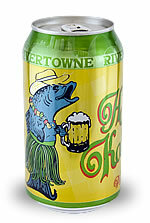 So I did the weirdest thing I could: I popped this can of Rivertowne Hala Kahiki pineapple beer that was in the fridge (a sample, a freebie). What the hell! Hey, I had a grapefruit radler last week that was strangely appealing, so who knows? First thing to know: I really like fresh pineapple, one of my favorite things to eat. Second thing to know: I really like Rivertowne, these are cool people. How is it? Well...I'm gonna finish it, because it's not bad...it's not sucky sweet, and it does taste like pineapple, but there's a nice light ale finish...but I don't think I'd order it at a bar. It's just not beery enough; more fruit than fruit beer. Unless...it was hot, and I was in the mood for a tiki drink, in which case, this would be perfect. Because that's the third thing you need to know: I have a secret lust for good tiki drinks. That's me, at the Cotton Blossom Lounge, in Lethbridge, Alberta, sipping a concoction of rum, blue curacao (forgive me), pineapple juice, and apricot brandy. It's southern Alberta's best indoor patio; trust me. WHAT A GREAT NEW BOTTLE WOW HOLY CRAP ITZ SO COOOOLL!!! People used to ask me, back in the days before The Great Craft Rationalization®*, 'Lew, why don't you ever write about the regular beers? Budweiser, Miller Lite, Coors Light; you know, the beers everyone really drinks?!' And although I did write about beers like that sometimes -- more in a business mode, but I did write for trade journals, so you do; hell, I wrote two vodka pieces! -- and I made my mark writing about Yuengling, my response was usually something like, "Well, what can you say about them? 'Damn, this Budweiser tastes just like the last 100 Buds I've ever had!' They don't change, there's never anything new, and even the people who love them have nothing to say about the flavor past "crisp," "clean," and "great taste, less filling." There's just not a lot to work with there." We are, after all, ultimately in the story business. Hats off to A-B, who did try to engage us by flying groups of beer writers to their hop farm and maltings in Idaho...but then that turned into a circular firing squad of mutual ethics accusations and just got ugly. And mostly, beer writers didn't write about mainstream beer. Well...MillerCoors is changing all that! I've been seeing the teaser billboards on I-95 in Philly (one of the big Lite markets) for months now, and the new Miller Lite bottle is finally here! That's right, a NEW BOTTLE! Hot damn! WOW! I guess all the beer geeks who say the different glassware really makes a difference may have a point, and Miller Lite is keying on it. I'm yanking Miller's chain, but come on, guys... A new bottle? You already did that! Remember the Vortex bottle, back in 2010? Had a set of spiral grooves on the inside of the neck? Jay Brooks summed that up pretty well here, I mean, what's the point of swirling Miller Lite as it comes out of the bottle, to stimulate the lack of aroma? Maybe...except I did an interview that year with the folks from Owens-Illinois, who developed the Vortex bottle, that I never found a market for and never released...and it shines a light on things here. Have a look. Within the consumer package and beer industry, people are looking for something new and different. It's important to differentiate. It brings added value and news to the marketplace. The Miller Lite brand has seen a lot of change and not all of it positive. It's innovation in terms of value and news to the brand. Internal embossing is a tech that Owens-Illinois brought to the marketplace. It's the most significant change to the long-neck bottle since the twist-off cap. The Vortex bottle is an example of how we can merge the science of glass with the art of package design to bring something the market hasn't seen before. It's designed to differentiate the brand on the shelf. You get the decorative look, and a flat panel for the labeling. We're working with the customers and letting them lead with that effort. Now...did you notice? Nothing about swirling the beer. That all came from craft guys who assumed it had to be for something. As far as O-I was concerned -- and I was talking to their beer marketing manager and the VP of global innovation -- this was about the look of the swirl. Even Miller never specifically said that the vortex was functional. It's about look. It's all about getting you to look at Miller Lite. No kidding, right? They're just making up news to get themselves noticed! Because there's nothing new about Miller Lite! But what about the constant stream of one-offs and one-time seasonals from craft beer? It's all about the beer! Is it? Or is it about getting you to notice them, shouting to be heard over the new darlings -- 16 oz. cans, 'slim' cans, open-top cans, nanobreweries, reality-TV breweries, collaborations -- and then moving on and making something else new? Look, I like new beers. It's how things happen. But they ought to have some kind of intrinsic value. There are an awful lot of "me too" beers out there among all the innovative ones. It's almost reached the point where making a pale ale is innovative, as people run from them to make exotics. New beer? New bottle? It's all attention for the brand. Miller Lite spins off way too much money to mess with it; you can't make a craft version (they tried that; major fail). But the craft brewers look at big crafts who leaned hard on a flagship -- Sam Adams, New Belgium, Sierra Nevada -- and they see them running into trouble with their street cred, being passed up as not really craft. (Admit it, if you haven't thought that about Boston Lager, Fat Tire, or SNPA, you've heard someone say it.) And we get new beers that are made just to have new beers. Better than a new bottle, but...where's it go? BeerAdvocate? Tickerville? Celebrator? I dunno. It's how things work, but for what part of the market? Who reacts to this stuff, and is it enough to have a real effect? Is it just a new bottle?